USPP #17490, COPF Pride of Place Plants Inc. 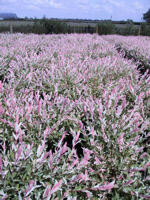 The foliage is spectacular deep pink/red in Spring and retains strong color throughout the growing season. Flamingo produces a beautiful range of contrasting colors for addition to your garden. Can be a lovely hedge of single bush.